With its continued commitment and leadership in manufacturing energy efficient pool pumps, Pentair has been recognized by the U.S. Environmental Protection Agency’s (EPA) as an ENERGY STAR® Partner of the Year since 2013, and a recipient of its Partner of the Year – Sustained Excellence Award in both 2016 and 2017. Pentair offers 80 ENERGY STAR certified pool pump models, representing approximately 40 percent of all certified pool pumps in the industry. 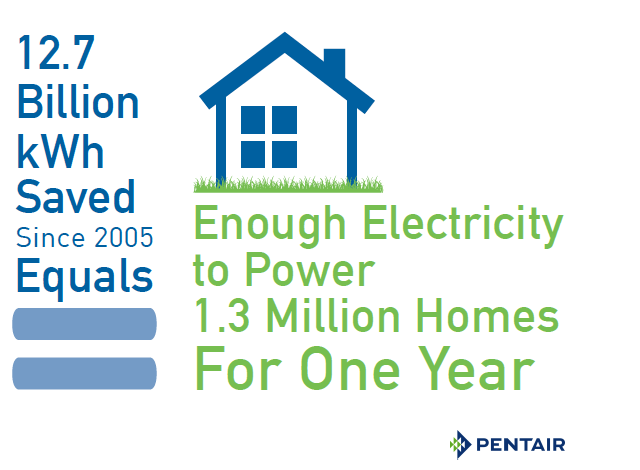 Alongside technological innovation, Pentair has worked to educate consumers about energy savings opportunities. In 2017, Pentair held more than 500 hands-on pool pump demonstrations at retail outlets and consumer home shows showcasing the benefits of ENERGY STAR certified pumps. Pool professionals that would like to participate in Pentair’s equipment training program should visit https://www.pentairpartners.com/workshops/. To learn more about the company’s complete line of energy efficient pool pumps, as well as other Pentair Eco Select pool products designed to help save energy, conserve water, eliminate or reduce noise, or otherwise contribute to a more environmentally responsible equipment system, visit pentairpool.com.